Lord Huron is an American indie folk band based in Los Angeles. The group's debut album, Lonesome Dreams, was released in 2012 on Iamsound in the US and Play It Again Sam in UK and Ireland in January 2013. The band’s name was inspired by Lake Huron, the lake which band founder Ben Schneider grew up visiting, where he would spend evenings playing music around the campfire. The band's third album, Vide Noir, was released on April 20, 2018. Founding member Ben Schneider began writing music in his hometown of Okemos, Michigan. Schneider went on to study visual art at the University of Michigan and finished his degree in France, before moving to New York City where he worked for an artist. In 2005, Schneider moved to Los Angeles. In 2010, Schneider formed Lord Huron as a solo project, recording his first few EPs entirely on his own and steadily adding members to help play in live shows, most of whom he had known since childhood. Their first full-length album, Lonesome Dreams, was released on October 9, 2012. It peaked at No. 3 on Billboard's Heatseekers Albums chart, selling 3,000 copies in its first week. The album has sold 87,000 copies in the United States as of April 2015. With the release of Lonesome Dreams, the band also slowly released a series of music videos, all filmed in a western '70s style, which Schneider says was the focal point and narrative for the album. “We had this fun idea that Lonesome Dreams was kind of this series of old adventure tales. It's sort of a collection of pulp fiction and we wanted the videos to kind of reflect that and have that same feel and style,” Schneider said in an interview. They also decided to release a theatrical version of the videos. The band released their second album, Strange Trails, on April 6, 2015, in the United Kingdom and April 7, 2015, in the United States. The album debuted on the Billboard 200 at No. 23, and Folk Albums at No. 1, and No. 10 on the Top Album Sales chart, with 18,000 copies sold. The song "The Night We Met" was RIAA certified gold on June 26, 2017 and certified platinum on February 15, 2018. 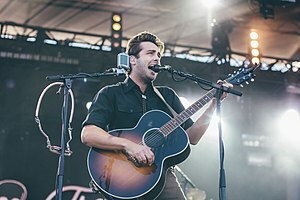 In January 2018, several short videos released on Lord Huron's official Facebook, Instagram, and Twitter accounts with short clips of audio led to speculation of an upcoming album release. The album was officially announced to be the band's third album, Vide Noir, and was released on April 20, 2018. On January 26, 2018, Lord Huron released their first single from the album, a two-part song called "Ancient Names".. On February 16, 2018, Lord Huron released the next single, "Wait By the River". On March 7, 2018 they made an appearance on Jimmy Kimmel Live! to perform "Wait By The River". Lord Huron performed an extended preview of Vide Noir on March 8, 2018, at Teragram Ballroom in Los Angeles, CA. They debuted five songs off the new album: "Ancient Names (Part I)", "Ancient Names (Part II)", "Wait by the River", "Never Ever", and "Vide Noir". On March 27, 2018, they performed another preview set at Le Poisson Rouge in New York. They played the same five new songs as at Teragram Ballroom plus two more songs from the yet-to-be-released album, "When the Night Is Over" and "Back From the Edge". On the day of the album release, April 20, 2018, Lord Huron played an official release show in Grand Rapids, Michigan, Schneider's home state. On July 11, 2018, Lord Huron recorded two Spotify Singles 'When the Night is Over' and Neil Young's 'Harvest Moon' at Spotify Studios. On August 11, 2018, Lord Huron performed a medley of the songs Never Ever, When the Night is Over, and Moonbeam from the album Vide Noir on the CBS This Morning: Saturday Sessions. Their song "Ends of the Earth" has appeared numerous times onscreen. It plays during the end credits of the 12th episode of the third season of the Showtime television series Shameless and the 6th episode of the second season of FXX's Man Seeking Woman. "Ends of the Earth" also appears in the films Endless Love and Walking With Dinosaurs (2013), as well as at the series finale of the TV show Community. It is also used in the series finale of the Netflix series Longmire, in the Netflix Documentary Unbranded, and in a TV commercial for jewelry company Zales and sporting-goods company Eddie Bauer. This song is also played during the end credits of the 2015 film, Road Hard. Country singer Kenny Chesney covered this song on his 2018 album, "Songs for the Saints". The song "The Night We Met" is used in the 5th episode of the fourth season of The Affair on Showtime, in the 22nd episode of the second season of The CW's "The Originals", the 18th episode of the first season of The CW's The Flash, in the 4th episode of the second season of NBC’s The Night Shift, and in the 5th episode of the first season of the Netflix television series 13 Reasons Why, and again in the 13th episode of the second season of the latter. In the 2015 film Freeheld, the band's track "Louisa" is used in the country western dance scene where Julianne Moore and Ellen Page's characters are dancing together. The band's track "Fool for Love" is used in the end credits of the episode "Wedding Day" of HBO's Girls and "Bonnie" of Lovesick, and was also featured in the Season 7 episode "Hyperion Heights" of Once Upon A Time. The songs "She Lit a Fire", "Ends of the Earth", "Brother", "The Ghost on the Shore", and the previously-unreleased track "The Birds are Singing at Night" are all used in the film A Walk in the Woods. Their song "The Yawning Grave" appears in the 11th episode of the seventh season of The CW's The Vampire Diaries. The song "Lonesome Dreams" is used in the 7th episode of the first season of HBO's Togetherness. The song "When the Night is Over" appears in the 15th episode of the third season of Chicago Med and also “TCM Remembers 2018”. The song "Love Like Ghosts" appears in the 9th episode of the ninth season of Shameless. The song "Time to Run" appears in the 12th episode of the ninth season of Grey's Anatomy. ^ Thomas, Fred. "Lord Huron – Overview". AllMusic. Archived from the original on December 6, 2016. Retrieved July 9, 2017. ^ "Lonesome Dreams - Lord Huron - Songs, Reviews, Credits - AllMusic". AllMusic. ^ "Lord Huron: Lonesome Dreams Album Review - Pitchfork". pitchfork.com. ^ a b Jennings, Zeke. "A Q&A with Okemos native Ben Schneider, whose band Lord Huron is on the rise". M LIVE. ^ a b "Lord Huron on Twitter". @LordHuron. Retrieved January 24, 2018. ^ Lord Huron's folk forges a pioneer's path. Boston Globe, October 6, 2012. ^ "Lord Huron: Lonesome Dreams". AllMusic. ^ a b "Upcoming Releases". Hits Daily Double. HITS Digital Ventures. Archived from the original on April 3, 2015. ^ "CULTURE: A Conversation with Lord Huron (Ben Schneider)". ^ Trust, Gary (August 16, 2015). "Taylor Swift Tops Billboard Artist 100, Wiz Khalifa Blasts to No. 3". Billboard. ^ "Gold & Platinum". RIAA. Retrieved April 21, 2018. ^ Simpson, Dave (April 20, 2018). "Lord Huron: Vide Noir review – pop goes the astral plane". The Guardian. Retrieved April 20, 2018. ^ "We've Got Two New Lord Huron Songs — And A Secret". ^ "Lord Huron Announce New Album Vide Noir With Two-Part "Ancient Names"". January 26, 2018. ^ "Lord Huron – "Wait by the River"". February 16, 2018. ^ LordHuronVEVO (March 9, 2018). "Lord Huron - Wait by the River" – via YouTube. ^ "Los Angeles Gets A First Taste Of Taste Lord Huron's Vide Noire At Teragram Ballroom – Blurred Culture". ^ "Lord Huron Setlist at Le Poisson Rouge, New York". setlist.fm. ^ "Lord Huron 'Vide Noir': Stream". April 20, 2018. ^ "Lord Huron Deliver Sultry Medley Of Songs From 'Vide Noir' On 'CBS This Morning': Watch". Billboard. Retrieved August 14, 2018. ^ "INTO THE PURE BLACK VOID: LORD HURON PREVIEWS NEW SONGS AT LPR - Pancakes And Whiskey". March 30, 2018. ^ Crespo, Charley (March 27, 2018). "Everynight Charley's Manhattan Beat: Lord Huron at le Poisson Rouge". ^ "Soundtrack for Neflix's '13 Reasons Why' to Be Released - Film Music Reporter". filmmusicreporter.com. Retrieved August 5, 2018. ^ "Music from Once Upon A Time S7E01". Tunefind. ^ "A Walk in the Woods (2015)" – via www.imdb.com. ^ "Music from Togetherness S1E07". Tunefind. ^ a b c d "Lord Huron Chart History". Billboard. Retrieved May 1, 2018. ^ a b "Discografie Lord Huron". ultratop.be (in Dutch). Hung Medien. Retrieved September 19, 2017. ^ a b "Lord Huron Irish Charting". irish-charts.com. Retrieved December 18, 2017. ^ a b "Lord Huron" (select "Albums" tab). Official Charts Company. Retrieved June 17, 2017. ^ Caulfield, Keith (April 29, 2018). "J. Cole Claims Fifth No. 1 Album on Billboard 200 Chart & Biggest Week of 2018 With 'KOD'". Billboard. Retrieved April 30, 2018. ^ "Lord Huron - Chart history - Billboard". www.billboard.com. ^ "Lord Huron- Adult Alternative Singles". Billboard. Retrieved September 8, 2017. ^ a b "Lord Huron - Chart history - Billboard". www.billboard.com. ^ "The ARIA Report" (PDF). ARIA. May 8, 2017. Retrieved May 9, 2017. ^ "Discographie Lord Huron". lescharts.com (in French). Hung Medien. Retrieved May 28, 2018. For "The Night We Met" feat. Phoebe Bridgers: "Le Top de la semaine : Top Singles - SNEP". Syndicat National de l'Édition Phonographique. Retrieved January 15, 2019. ^ "Lord Huron Schweizer Hitparade". Hit Parade. Retrieved August 16, 2017.